Cresson, PA - Jennmar Corporation, a multi-facility steel coil processor and distributor has installed its third Braner/Loopco high-performance Single-Loop Turret Head™ Slitting and Packaging Line in its Cresson, PA coil processing and manufacturing facility about 60-miles east of Pittsburgh. 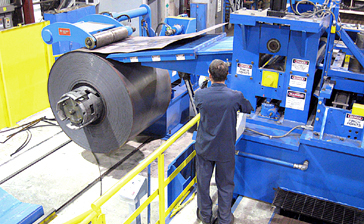 Jennmar operates two additional Braner/Loopco Slitting & Packaging Lines at its facility in Charleston, SC. 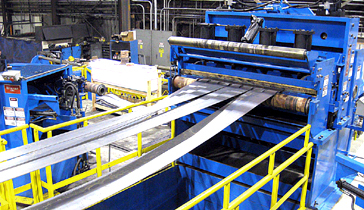 Jennmar's latest new Slitting Line has the capacity to process 60,000# x 80,000 PSI yield strength hot rolled black, pickled, cold rolled and galvanized carbon steel coils in gauges from .024" through 5/16" at line speeds to 1,000 FPM. 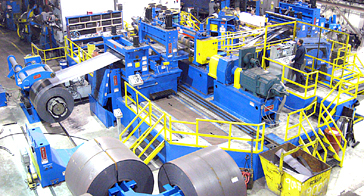 Single-Loop Turret Head™ Slitting Line processes high-strength hot rolled and cold rolled carbon steel coils in gauges from .024" through 5/16" in tight-line, push-pull, and single-loop operating modes. 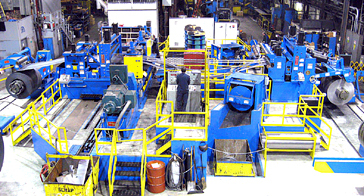 Jennmar's Turret Head™ Slitting Line is equipped with Entry & Exit 4-Arm Turnstiles, Coil Straightener, Entry & Exit Shears, and 700 line horsepower. Pushbutton Tooling Lock-Up Turret-Head™ Slitter: The Jennmar Slitting Line includes a Turret Head Slitter equipped with two (2) quick-change Pushbutton Tooling Lock-Up slitter heads and a 300 HP-DC drive train. Turret Head™ Slitter arbors are mounted in precision machine tool quality bearings installed in massive one-piece stress-relieved and precision machined solid steel arbor housings. The rotatable Turret is mounted on a precision anti-friction ring bearing, which assures precise arbor alignment and makes slitter head exchange quick and effortless. 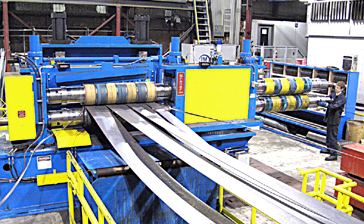 Jennmar's Slitting Line is an example of Braner/Loopco's high-performance compact high pass line arrangement that positions the Uncoiler and Recoiler at floor level with the strip processing section elevated. Benefits include elimination of reverse-bend coil-breaks, elimination of strip surface damage from deflector roll scuffing, and superb coil tracking that produces tight straight side-wall slit coils. The compact line conserves floor space, speeds coil threading, and provides excellent sight line visibility without cameras and monitors. 60,000# master coils are handled by an expanding mandrel shifting base Uncoiler. Lightweight Uncoiler Fillers are quickly installed for handling large hot band coil IDs. An Entry Coil Straightener removes heavy-gauge coil-set and threads the strip to the Crorp Shear and Turret Head™ Slitter, while hydraulic cylinder positioned thru-hardened 52100 tool steel Side Guides position the strip. A fiber-optic hydraulic servo Edge Guide System maintains coil edge position while running. 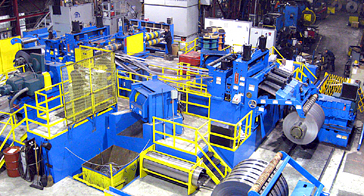 A Hydraulic Guillotine Shear crops coil ends and deposits the scrap into a power travel and unload Scrap Cart. The outboard arbor housing is supported on precision anti-friction machine tool slides and is engaged and disengaged by pushbutton. Large precision machined aluminum-bronze guide blocks secure the adjustable upper arbor bearing boxes in the arbor housings. The unique design produces "zero" axial arbor play and precise slitting tolerances. Due to its unique patented design, Turret Head™ Slitters can be re-tooled quicker and heads exchanged faster than with any other type multi-head or knife transfer slitter. Reliability is bullet-proof. Turret Head™ Slitters are rugged, precise, and are bullet-proof reliable. Head change time is less than two-minutes. Jennmar's "Pushbutton Tooling Lock-Up" allows re-tooling to be accomplished fast, and arbor/nut thread maintenance and repair is eliminated. A pneumatic Pad Tensioner generates strip tension necessary to produce tight straight-wall slit coils. To reduce order change down-time, the tension pads can be exchanged in 60-seconds when the pad surface is worn, and the underarm separator arbor can be exchanged with a pre-tooled arbor in 30-seconds.